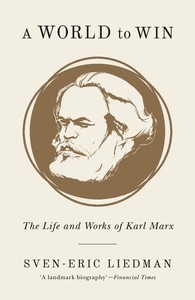 In this essential new biography--the first to give equal weight to both the work and life of Karl Marx--Sven-Eric Liedman expertly navigates the imposing, complex personality of his subject through the turbulent passages of global history. A World to Win follows Marx through childhood and student days, a difficult and sometimes tragic family life, his far-sighted journalism, and his enduring friendship and intellectual partnership with Friedrich Engels. Building on the work of previous biographers, Liedman employs a commanding knowledge of the nineteenth century to create a definitive portrait of Marx and his vast contribution to the way the world understands itself. He shines a light on Marx's influences, explains his political and intellectual interventions, and builds on the legacy of his thought. Liedman shows how Marx's masterpiece, Capital, illuminates the essential logic of a system that drives dizzying wealth, grinding poverty, and awesome technological innovation to this day. Compulsively readable and meticulously researched, A World to Win demonstrates that, two centuries after Marx's birth, his work remains the bedrock for any true understanding of our political and economic condition.